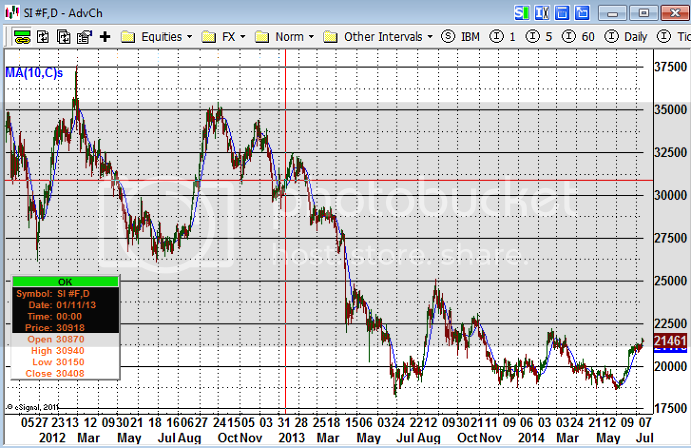 / Gold / Gold News / The Time to Stack is When Retail Investors Are Liquidating Their Metals! The Time to Stack is When Retail Investors Are Liquidating Their Metals! Following public statements is a way to lose not gain money. What would be interesting to me might be learning that the local coin shop did a brisk business buying from retail back into stock. If I were to buy at the same price and time I would be on the other side from retail, and more optimistic. In matter of fact, my optimism for a good trade would be pretty much inversely correlated to the pessimism of the small traders as a group. But that, while a step forwards, is still not enough. This really is a tough business, and every newcomer has to learn that the same expensive way. When I read on matters to do with silver I often find myself entertaining doubts. Now that is entirely to be expected when talking about anything to do with all financial markets, where bets are essentially being placed on the outcome of unknown future events. Went to pick up a few Franklin Halves today. There were at least ten people waiting outside the shop when the doors opened. After they opened up, within 15 minutes, the place was packed. At least thirty or forty people. They had three or four more people behind the counter than in the past. Looks like it was some of the regular guys’ wives helping out. While I was waiting for one of the guys to pick my Franklins out of his “junk” bucket they moved three monster boxes of ASEs and another lady picked up thirty 10 oz bars of silver. I think I overheard at least twenty gold eagle and gold maples buys as well. Of everyone in the shop there were only two or three people selling, the rest were buying and buying big. This is in the Peoples’ Republic of Maryland. What it must be like in the red states, I can’t imagine. Puck posted that blog entry on Saturday January 12, 2013. (His blog is worth reading through over a period IMO) It described a busy time for the retailers of silver in his local district, with retail buying from the trade at a brisk pace. I left the red crosshairs on the day in question, well the following Monday, since Saturday the 12th was a closed market day. We can see that this was not the best time to buy silver heavily, though Puck describes more a regular small type purchase for himself, I reckon that the other customers present who bought three monster boxes of silver eagles and the thirty 10 oz bars on that weekend, with spot silver at 30.91, may have suffered some angst when silver traded at 18.18 less than six months later. A decline of 42% in such a short time is seriously debilitating financially speaking, and probably bad for the physical state of health too. With silver now at 21.46 those unfortunate people are running, if they have not unloaded at a serious price low, at approximately a 30% loss, not including price premia over spot on their coins or bars. So it would appear that retail, the small speculator trader, was wrong in this case. This is an adage of sorts, “swim with the whales”, rather than with the “minnows”, when trading. Certainly the size of funds traded by large traders would at face appear likely to be better informed and more thoroughly researched than small money risked by the individual small trader. Or is this the case? This weekend I noted that the trader George Soros in recent declaration disclosed acquisition of mining stocks, and the source was considering that this is a positive piece of information. I am not so sure. I mean, if I had been aware of this the day, or even the week that Soros bought the stocks, I might have considered jumping aboard for a speculative ride. But now, later, not so much. Billionaires are like that. For some reason they don’t want to make it easy on us little traders. Another piece of information, one which did not come to my notice this weekend, is the kind where a well known, famous, respected type hedge fund manager does an interview and declares “his book”. Kyle Bass comes to mind, Hugh Hendry might be another who I have great respect for. However whenever I read these people saying things like “the Yen is going to bomb” or whatever, I do not rush out to put on trades based on this “good advice”. You see, I never forget that while it may once have been “good advice” when they did the trade, now is later, much later, and prices are not what they were at the time opportunity knocked for Kyle or Hugh. So it’s all very interesting, but it’s not actionable, and it’s not fresh, and every dog in town who wanted to play already has had a bite of that particular bone. In speculation, following public statements is a way to lose not gain money. What would be interesting to me might be learning that the local coin shop did a brisk business buying from retail back into stock. If I were to buy at the same price and time I would be on the other side from retail, and more optimistic. In matter of fact, my optimism for a good trade would be pretty much inversely correlated to the pessimism of the small traders as a group. But that, while a step forwards, is still not enough. This really is a tough business, and every newcomer has to learn that the same expensive way I suppose. Can I bring anything to the table today which is not already in the public domain? There is a lesson of sorts in the above anecdote I guess, but it’s hardly rocket science. If I post a few charts, would that seem like fresh information? Charts are ten a penny after all, and there are lots of other charts out there waiting to be looked at, right? The problem with charts is … well … anyone can do charts! So let me put that notion to bed right now. Charts are a picture of information in visual form. If I show one trendline on a chart does that make it special. No? Yes? Consider this: if I did that, show one trendline, one only I mean, then why did I not show other trendlines too? 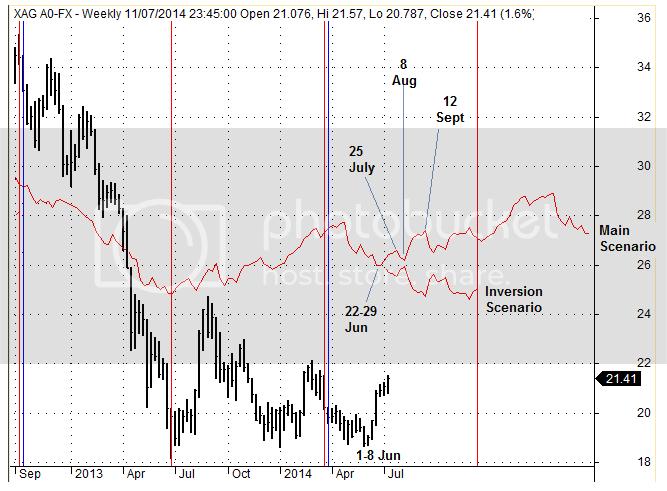 There is much to see in a chart if the looker is prepared to look really carefully. I can look at a chart for several minutes, really intently – to the point where if called by a family member it might take a couple of seconds for my conscious brain to register what my ears had heard. Anyway, enough of that. All I want to say is that there are varying levels of concentration and this is something that matters, but is invisible and unnoticed by a passing glance. Now go back to the chart you just looked at above and try to explain to yourself why it is that you didn’t instantly notice that the people in Puck’s LCS that day bought their monster boxes of silver (1) right below the price low of October 3 months prior, and (2) with an interim lower high in place end of November-early December one month prior? Maybe you saw that in the first passing glance? If not, how carefully did you actually “look”? For how long? One thing we can control in today’s markets is ourselves and our actions, and particularly the care with which we acquire “fresh” information. Provided we take the trouble to actually do this of course! 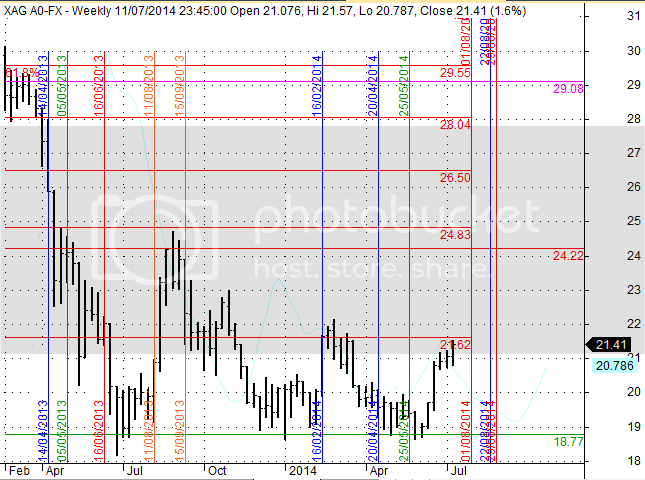 This is the grid for weekly silver. Not every horizontal works. Not every vertical works. But many do. Crosses of the two have funny effects on the silver price … sometimes but not always. There is a “form” that is not obvious. Looking hard will only aid but never cure the need for more information. That partial view is all the information this chart gives. Looking through a glass darkly, as the scribe said millennia ago. 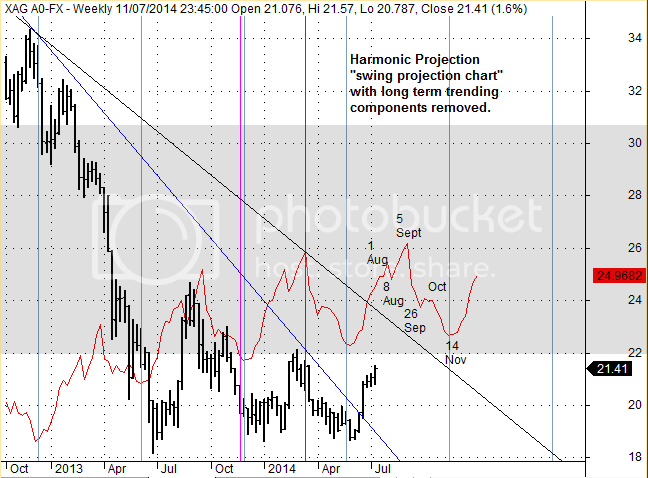 This is a silver harmonic projection forecast, together with an alternative “inversion of cycles” scenario shown. The dates are shown. It’s more quantum physics than technical analysis. But if I had not made this “chart” myself, and saw it here as if I were a reader, I would have to take a vertical ruler and compare every wiggle of the redline with every turn of the price, to evaluate the amount of lead or lag for earliness or lateness of the forecast, also to see if “bigger” turns were found better or worse than “little” turns. But you could just read the dates I suppose …. much depends on what you want, doesn’t it? While I am at it, here is another harmonic which works as well for silver, so if there is a “flip” it would probably take the form of a jump in price behaviour from the above towards the next scenario or back. This is a short term regularity which has emerged, just for a while, in silver and which does not appear to have gone away quite yet. One thing I maybe should say about the small investor buying their first precious metal. A lot depends upon when exactly you become aware of reasons that motivate you to buy this stuff. I mean, if you never had any, and become aware that you think you should, the obvious thing might appear to be to go out and get some fast. Usually the advice suggests that some “insurance” should be got quickly, if none is already owned. But there is a strange thing about financial markets you need to know. It is that the passing of knowledge tends to be after the time it was most useful. Like for the hedge fund manager interviews I described above. I merely remind that big things happen slowly, and there are a lot of red faced people out there with “the end of the world is nigh” sandwich boards and placards gathering dust in the back of the wardrobe. So it’s usually a good idea to take time to look around before doing anything in markets. How much time? That would be “fresh” information. Those folks are reliable people. They will surely tell you afterwards! Otherwise look harder at your charts or find another way. What advice can I offer newcomers that does not appear “cryptic”? It’s actually not cryptic, you just need to get sensitized to what matters most to “get” that! divide the amount you are going to spend by 4. Put half of it away in cash for when the 1st quarter disappears in “tuition cost”. Then it is good to multiply the reading time allocation by 4. Next I suggest reading Zen in the Art of Archery, or Mastery which are nothing to do with finance, and everything to do with it! and buy a copy (for repeated reading) of Reminiscences of A Stock operator for yourself. Then study things called “risk management” and “money management” as applied to traders in financial markets. Finally read up on rogue traders, and find out what they did, and don’t do it!